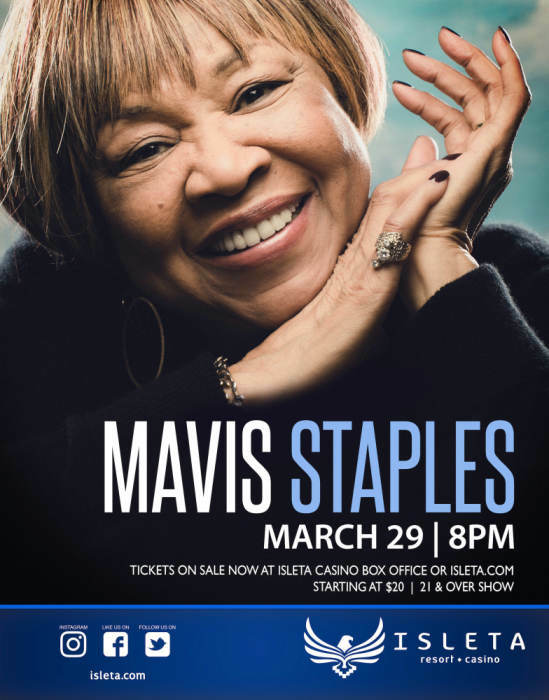 Isleta Resort & Casino is proud to present Mavis Staples on Friday, March 29, 2019 at 8pm. You know her as part of the Staples Singers who brought you hit songs like "I'll Take You There," Respect Yourself" and " Take a Load Off Fanny." Get your tickets today to see the legendary Mavis Staples in the NEW Isleta Resort & Casino Showroom. This is a 21 and over event and tickets start at just $20. A link will automatically be distributed via text or e-mail for all online purchases to download tickets 48 hours prior to the show.